Butter rectangular pan, 13x9x2 inches, or line with aluminum foil, leaving 1 inch of foil overhanging at 2 opposite sides of pan. Heat sugar, milk, butter and cream cheese to boiling in 6-quart Dutch oven over medium-high heat and cook 6 to 8 minutes, stirring constantly. Reduce heat to medium. Cook about 10 minutes, stirring occasionally, to 225° on candy thermometer; remove from heat. Quickly stir in marshmallow creme and vanilla. Pour 4 cups hot marshmallow mixture over white baking chips in large bowl; stir to mix. Stir milk chocolate chips, semisweet chocolate chips, cocoa and nuts into remaining marshmallow mixture. Pour one-third of the white mixture into pan, spreading evenly. Quickly pour one-third of the chocolate mixture over top, spreading evenly. Repeat twice. Swirl knife greased with butter through mixtures for marbled design. Cool until set. Refrigerate uncovered about 3 hours or until set. Cut into 12 rows by 8 rows with knife greased with butter. Store covered in refrigerator. 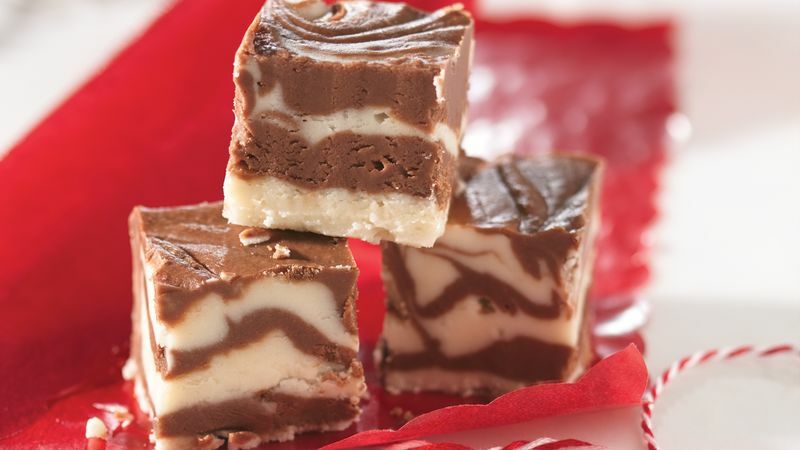 Let us share another recipe for gift giving--Layered Brownies. To make the gift, layer the following ingredients in a 2-quart glass jar and seal the jar: • 1/3 cup baking cocoa • 2/3 cup sugar • 1/2 cup semisweet chocolate chips • 1/2 cup white baking chips • 2/3 cup packed brown sugar • 1 cup plus 2 tablespoons all- purpose flour • 1/2 teaspoon salt • 1/2 cup coarsely chopped nuts, if desired Attach a small wooden spoon to the jar with a festive ribbon along with these directions for baking: Directions for Baking: Mix contents of jar with 2/3 cup vegetable oil, 3 eggs and 1 teaspoon vanilla in large bowl with spoon. Pour into greased 9-inch square pan, and bake at 350º for about 30 minutes.